Dry Link’s patented sanitary dry‐disconnect couplings or spill free couplings, are renowned within the chemical and pharmaceutical industries for the safe transfer of hazardous liquids. Whether you are a small‐scale lab, medium sized batch processor, or large manufacturer, we offer the right High‐Containment Valve to safely transfer powders to suit your needs with full support and validation from start to finish. Unlike many “Sanitary” dry disconnect couplings in the market, Dry Link dry break couplings are the only true sanitary, drip‐free couplings available in the market, because of their simple bu?tterfly design. The smooth mirror‐polished bore has no voids, dead spaces, crevices, or fillers that could trap bacteria. They can assure safe and secure transfer of hazardous materials in the pharmaceutical & biotechnology processes. 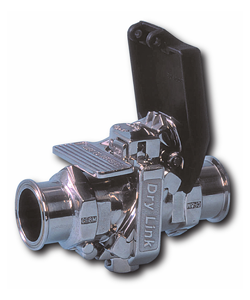 The Dry Link valves are available in sizes 1/2”, 3/4”, 1” (DN 25), 1½” (DN 40), 2” (DN 50), 3” (DN 75) and 4” (DN 100).